With WineLab is possible to determine the Total Sulfur Dioxide in wine in 1 minute with a simple photometric reading using the wine as is without having to resort to the distillation according with the reference method OIV or to the iodometric titration according with the simplified method. Calibration is not necessary. The sulfur dioxide contained in a wine is made to react with an organic disulphide in order to form a colored compound, whose intensity, measured at 420 nm in end-point, is directly proportional to the concentration of total sulfur dioxide in the sample. Sulfur dioxide (SO2) is used in oenology mainly as preservative, but also for other purposes (for example for antiseptic, antioxidant, antioxidasic, solubilizing, combining and clarifying functions). Part of the SO2 that is added as potassium metabisulfite to musts and wines undergoes a series of reactions. Therefore, after a short period of time, most of the sulfur dioxide reacts with some of the substances present, binds with them and forms addition compounds (combined sulfur dioxide) that are unable to express the typical properties of unbound molecules. Therefore, only the part that does not combine (free sulfur dioxide) plays an important role in preserving wine from oxidizing alterations and from some micro-organisms. 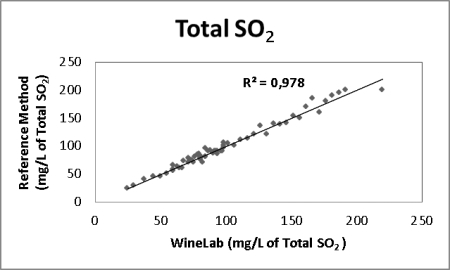 This test can be used to determine the total content of SO2 in wine, which is the sum of the free and combined sulfur dioxide fractions. For samples with SO2 > 200 mg/L, use 10 µL of sample and multiply the result by 2.5. Total sulfur dioxide was last modified: February 8th, 2019 by CDR s.r.l.